Coriander, commonly known as Dhania in the Indian Subcontinent or Cilantro in the Americas and some part of Europe, is an herb which is extensively used around the world as a condiment or as a garnish or as a decoration on the dishes. 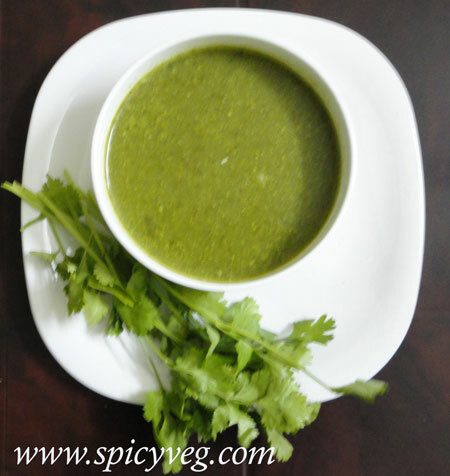 Coriander is very rich in useful natural elements and micro nutrients. It is a perfect source of various vitamins, dietary fiber, minerals like sodium, calcium, magnesium, phosphorus, potassium, manganese. 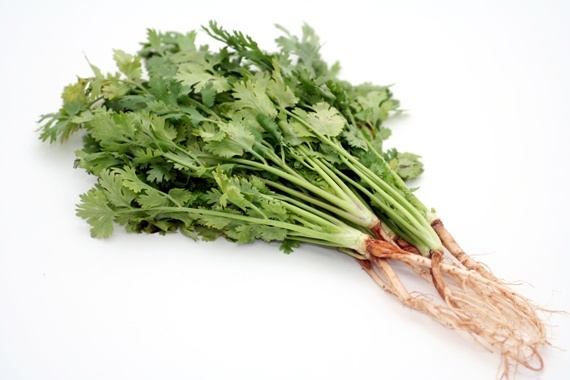 Cilantro, also known as coriander, has a distinct aroma due to its concentrated essential oils. This captivating aroma may have been responsible for humans around the world intuitively incorporating cilantro into their diets for health reasons . An aromatic and healthy soup. This is an interesting deviation from the regular vegetable soup. very appetising, and the coriander lends its own distinct flavour and colour for this soup. 1.Peel the potato and cut into small cubes or pieces. 2.Melt 1 tsp butter in a pan,add bay leaf,cinnamon and chopped potato.cook for 5 minutes on medium flame ,stirring in between. 3.Add 1 1/2cup chopped coriander,cook for 1 minute. 4.Reduce heat.Add 1/2 cup milk.cook for 2 minutes on medium flame,stirring continuously.Remove from fire.Let it cool. 5.Blend cooled mixture in a mixer to get a puree. 6.Return puree to the pan,add the prepared stock.Give 2-3 boils.Remove from fire. 7.Serve in individual soup bowls.Serve hot. 1.Cilantro / Coriander herb contains no cholesterol; but is rich in anti-oxidants and dietary fiber which help reduce LDL or "bad cholesterol" while increasing HDL or "good cholesterol" levels. 2.The leaves and seeds contain many essential volatile oils . 3.The leaves and stem tips are also rich in numerous anti-oxidant polyphenolic flavonoids . 4.The herb is a good source of minerals like potassium, calcium, manganese, iron, and magnesium. Potassium in an important component of cell and body fluids that helps control heart rate and blood pressure. Iron is essential for red blood cell production. Manganese is used by the body as a co-factor for the antioxidant enzyme superoxide dismutase. 5.It is also rich in many vital vitamins including folic-acid, riboflavin, niacin, vitamin-A, beta carotene, vitamin-C that are essential for optimum health. Vitamin-C is a powerful natural antioxidant. Cilantro leaves provides 30% of daily recommended levels of vitamin-C.
6.Coriander / Cilantro -Consumption of natural foods rich in vitamin-A and flavonoids (carotenes) helps body protect from lung and oral cavity cancers. 7.Cilantro is one of the richest herbal sources for vitamin K. Vitamin-K has potential role in bone mass building by promoting osteotrophic activity in the bones. It also has established role in the treatment of Alzheimer's disease patients by limiting neuronal damage in their brain. 8.The coriander seeds oil have found application in many traditional medicines deodorant, digestive, carminative, fungicidal, lipolytic (weight loss), stimulant and stomachic. 1.Cilantro (coriander) leaves has been used in preparation of many popular dishes in Asian and east European cuisine since ancient times. Along with other spicy items, it is being used to enhance the flavor and taste of vegetable, chicken, fish and meat dishes. 2.The herb has also been used in the preparation of soups, and sauces. Popular Mediterranean cilantro pesto, prepared using fresh cilantro, red pepper, garlic cloves, olive oil, pumpkin seeds with slight lemon twist, is a great addition on pasta, in sandwiches . 3.Freshly chopped and sauteed coriander leaves are a great addition to green salad. 4.Cilantro or Coriander seeds powder is one of the main ingredients used in the preparation of curry powder.